I imagine working on a post during the off-season will be much like trying to work on a post this morning. It’s cold. It’s dark. The next room over, friends who freelance are in their fourth hour of drinking bourbon and working on their indie-rock-acoustic version of “Down By The River.” And I don’t have much to say. I’m excited for Josh Thole’s call-up like I was excited back when I still had magazine subscriptions and they showed at my door. I’ll watch for his first hit and his first home run and when he strikes out in consecutive plate appearances for the first time, I’ll certainly head for the back pages and read as deep as I can into his stats. But I’ll need something on the order of New York‘s Eliot Spitzer cover–post-scandal–to snap me back into focus. Really, my deepest regret is that I probably won’t see Carlos Delgado play again in a Mets uniform. It could happen, yes. But I haven’t heard Word One since his oblique strain during his rehab. Makes me recall wistfully that I figured Carlos Delgado to reach five hundred home runs faster than Gary Sheffield. Then I watched Gary Sheffield hit his five hundredth home run. More and more, I think myself the Mets Angel of Death; I got excited, despite my constant harangue, about Carlos Beltran playing rehab out at Keyspan Park with the Cyclones, and began a quick think about how I might get to tonight’s game. Then I recalled how I was in the stands when Angel Pagan hurt himself in his rehab assignment last year. The ball then ate up Jerry Hairston, Jr. Man on. They do, and the next ball gets past Hairston for a hit. I think in the off-season I’ll work on some back up plans: how to blather in the absence of blatherable material. My mother likes the old saw about not saying anything when there’s nothing to say. I once sat her down for ten minutes and told her why I thought that was an irresponsible thing for a creative person to do. Besides, it’s September. I love September. Labor Day’s a mandatory barbecue day. My birthday’s on the 15th. I was hired to this no-longer-new job last year on the 22nd, and with it came money to pay bills and go to games. And it’s cooler. I love sweaters. They make me look svelte. David Wright comes back tonight, and so there’ll be something to talk about at the end of the day, surely. That gives me enough reason to not bring my poison or voodoo or whatever it is to Coney Island and Carlos Beltran’s knees. I’ll stretch the material like any good writer might do. However, word is we’re closing early Friday. If there’s any chance of seeing Beltran play on Labor Day weekend, I am there. Those of you who are in the area are probably going to be eating pizza and drinking beer anyway. You should do so on Grand Street. If you do, say hello. I will not buy you a beer, unless you buy me one, but somewhat tangentially, I’m not contagious anymore and indeed, my head is quite nearly clear of congestion at this point. That alone should throw the proverbial wheel hard in the direction of approachably genial. So, yes, Amazin’ Tuesday. Two Boots Tavern. What I like to do from the Upper East Side is take a Lexington express train down to Union Square, transfer to the local, and transfer at Bleecker to a Sixth Avenue express. Three trains, yet the ride somehow takes about fifteen minutes. I’m somewhat attention-deficient, so the movement keeps me upbeat. Now then: I wrote this post on August 12th, about the new Rawlings S100 batting helmet (use your back button to return). On August 17th, I wrote this post hoping that Johan Santana wouldn’t suffer at my bony, cloak-wearing hand. Not “hands,” as the other is busy wielding a scythe. However, he’s now with Dr. David Altchek at the Hospital For Special Surgery. I meant to take a spin by there and see if there’d been anything laid at the foundation. Perhaps it’s just enough that someone spent last night behind the gates somehow, clad in black and holding a single thorny rose. Billy Wagner will probably not accept a trade to the Red Sox because he wants to be a closer, and Jonathan Papelbon already jigs-it-up for the Fenway folk. I think his particular brand of hard luck (and ours) will be at the negotiating table. Luis Castillo’s taken his lumps already. Chowdah’s got the ligament issue (and Chowdah didn’t even show until July). Sheffield’s got his/has his/will get his; I can’t keep straight what’s bothering that guy anymore. But at least he’s gone out there. This is good. Schneider’s a ghost already; predicting his doom would probably only RAISE his batting average. If you’ve seen a Star Wars or an Indiana Jones movie–or even Quentin Tarantino’s Inglourious Basterds (which, if you enjoy a ruthlessly bloodthirsty matinee, I recommend)–you’re familiar with something called “The Wilhelm Scream.” It’s reserved for the death of cannon fodder: a foot soldier who you KNOW is going to go down in a hail of whatever fired by whomever our hero is. If you do a search for NPR Wilhelm Scream, you’ll come across the On The Media transcript for an interview on said scream. Read (and listen? I don’t have the player) here. The Mets are not the bad guys, though they’ve been made out to be. But at this point, all the Mets have are redshirts: guys who really should be faceless. I can’t, therefore, try my hand at predicting the next Met injury because, to the extent that the guys out there are pretty much all the same redshirt, it doesn’t matter. Luke and Leia are going to manage to swing onto the other side of the bridge; Indy will get the better of Belloq. Good guys or bad, that’s the script. This is obviously not their year. As I’ve stated several times now, one should watch Mets baseball if Mets baseball is still fun. I will still watch, because it allows me time to decompress. And I enjoy a win whenever they do. Besides, after baseball comes football, but after football comes a whole lotta nothing. **I’ve been pulled from tonight’s game, by the way, in favor of Nelson Figueroa. I am told that this is the sound a car engine makes when it’s about to fall out. My mind has not so much been wandering as it’s been speed-jogging through vast wastes of half-remembered things I’ve done and things I’ve seen. This could either be the result of an unusually busy time at work or an extended stroke. If it’s a stroke, I have to hand it to my neurons, who’ve sought to bring me back to the days when I watched The Naked Gun 2 1/2 every other day for nearly a year. I left the house Thursday singing the film’s version of “Besame Mucho.” That brought me to O.J. Simpson, who, if you recall, had a supporting role in each of the Naked Gun movies before the… unpleasantness. Where were you when O.J. Simpson and Al Cowlings were “fleeing” the authorities in the white Ford Bronco? I was in a van myself: a brown Chevy, owned by a family friend who was driving a group of guys up to a house in Sullivan County, NY, to build a deck. My father went; I came along. I was in sixth grade. Sat on a milk crate in the back, with the tools. Bob, another Bob (but we called him Robert to distinguish), Frank, my dad, and me. Up the highway from Brooklyn in a two-seat Chevy van. And we followed the news via radio (we left the city at 7p). Lest you think this post a less-than-tasteful rehash of the Simpson trial, I’ll have you know that I was annoyed that we were listening to the coverage of a low-speed car chase, the whup-whup of helicopters only enjoyable when WATCHING ON TELEVISION. No, I wanted to listen to the Mets game. They were playing the Marlins that night out at Dolphin/Joe Robbie/Pro Player/Pro Player again/Dolphin/LandShark Stadium, and I had the fool notion that this would be Pete Smith’s chance to shine. Nevermind that he was already 3-6 on the year. Also, I’d rarely listened to baseball in the car, and being there with “the guys” made me think we’d be “the guys” riding up and listening to the game. But these guys, to a man, are jokers and wise guys, and there was not much fun to be had in baseball that year. And certainly not with the Mets. In the Mets’ defense, they walked off the job just three games below .500. Our current crop of Mets are seven below, which is chilly even in the dog days of summer. See what I did there, with the double meaning? As it turned out, however, it wouldn’t matter what we were listening to. When we broke out of getaway traffic, Bob hit the gas to make up for lost time. Thirty-five miles an hour. Forty. Forty-five… what’s that hum? Fifty… Dad, something doesn’t feel right here. Fifty-five… it’s not a hum; it’s a rattling. Is something shaking loose back there? Sixty: BRRRRRRRRRRRRRRRRRRRRRRRRAP! The thing shook like a gallon can of Benjamin Moore in the auto-mixer. But we weren’t going to drive forty-five miles an hour up to the house; we’d get there in the middle of the night (and “middle of the night” reminds me that Billy Joel’s “River Of Dreams” came out that year; what the hell is going on with me?). So we dealt with it. Robert got car sick. My dad was hoarse from laughing so hard. Bob, ever the even keel, went on like nothing was wrong. He even waved at the people passing us, most of whom, I’m told, were laughing and pointing. His biggest concern, and frankly mine as well, was whether we’d make it back at the end of the trip with our respective fillings still in our heads. There. I’ve just told you a more interesting story than last night’s game (vs. Astros, L; 5-4), which I watched via fast-forward recap, mildly hungover from a colleague’s housewarming the night before. I caught a glimpse of Gary Sheffield in one of the freeze frames, and thought about how, fifteen years ago, I thought he’d be a remarkable improvement over Joe Orsulak. Why the hell do I remember now that I thought fifteen years ago that Sheffield would be an improvement over Orsulak? Why do I get the feeling that if Sheffield didn’t have his endless cramp, he’d be batting third now, just like he did then? Why are the Mets a van that rattles like the Rapture’s coming whenever you need them to go the speed limit? Again, I am told this is the sound a car engine makes when it’s about to fall out. I’m locked in the death throes of a staff retreat until Tuesday evening. And then I go to a seminar on retirement planning. Until then, and after, let’s go Mets! Trading deadline’s coming; avoid cheap gas. *I know I’d said that I’d write something on Bernazard, but it’s been rather busy. Besides, the thing’s been talked to death already. Fire him or trade out one of the T-shirt launches for a regular mid-inning fight between him and Batdad. That’s essentially my opinion. Okay, okay. I kid because I love. In case you’d not heard, Jerry Manuel had a family chat with the team on Tuesday night, and the team rode over to Miller Park together Wednesday morning. Then Mike Pelfrey pitched a gem, and the Mets beat the Milwaukee Brewers 1-0 to avoid the sweep. In reply to a commenter on the previous post, let me say that it appeared by the encore presentation of the game that the Mets DID play some baseball. There is the notable exception of the seventh inning, wherein Mike Pelfrey, like Bono and Alexander Haig before him, forgot a key nuance of his day job and committed a balk. But they played ball, and I thank you for your words. I like to think we had some part in it. I’m a supporter of the idea that the Mets need a team captain. I also think they need to trade Oliver Perez and bid a heartfelt farewell to Fernando Tatis. But in all those cases, what does a team do if an injury takes that guy out? Mark DeRosa went over to the Cardinals, sprained his wrist after three games for them, and will be out for the next three or four games. And if the Mets trade Brad Holt and Bobby Parnell for Adam Dunn, and Adam breaks his hand trying to open a jar of pickles? And if the Mets sell half of the Acela Club, Mr. Met, and his kids for Roy Halladay, and Halladay breaks down like a ’77 Dodge Dart? …Though I’d almost do that deal. Swap Mr. Met for three minor-league mascot prospects, and make the call. Any Mets captain would have to be resilient and magnetic enough to draw attention even if on the bench. These attributes are not quantifiable; Mr. Franco was right about that. But what he has wrong is not the need, but the reason for the need. The Mets need a captain for our sake, not theirs. David Wright is right: we don’t know what goes on in the clubhouse behind closed doors. All reports are that Carlos Delgado is still at home recovering and Gary Sheffield’s a model citizen, so John Franco’s further afield than most. They need to play as a team, and pick themselves up in times of trouble. Playing coherent baseball as a team will keep the crew from air-mailing balls and throwing to the wrong bag and all that nonsense. 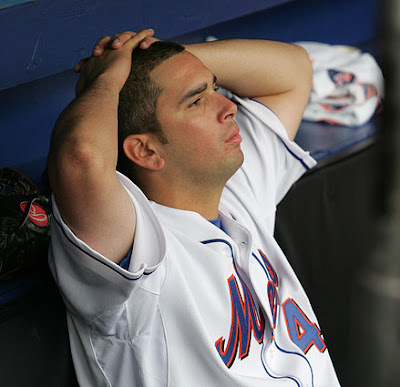 I think the 2009 Mets are working hard at playing as a team, with some glaring goddamn missteps. But we need a captain because on any given day during this injury crisis, we’ve seen half this lineup play a few handfuls of games. Argenis Reyes; Fernando Martinez; Nick Evans? To the masochistic Mets fan, these names are familiar if not battle-tested. To the casual observer, they’re nobodies. The captain fills the gap in crowd confidence with his captaincy, like so much *Great Stuff. And when the captain goes into the locker room, he controls the message to the media hordes who demand to know just what they’re gonna do about all these injuries and do you think Omar should trade for a bat or some rotation help and oh my gosh oh my goodness gracious the 2009 Mets are a step away from 1962! When Delgado comes back and Jose Reyes comes back and Carlos Beltran and J.J. Putz and John Maine come back, we should see these guys as a team with a colorful history. The captain can continue to control the message, but we really should hold no illusions that, when the door closes on the clubhouse, David Wright is going up to Carlos Delgado and telling Carlos how to play the game. Carlos would be well within his rights to take an aluminum bat to the man. The captain frees the rest of the team up to coalesce and do their job. The captain takes the heat for the other veterans and the rookies. For that, he’s awarded a slightly larger percentage of the glory and the pain. From this perspective, the reason Mr. Franco believes the Mets need a captain is because he needs to hear a player voice of authority account for what’s going on at the park. But to extend that to be the reason for the shoddy play is false. The Mets have not played at their best because they are not at all at full strength. A team in better shape, DL-wise, would be the Philadelphia Phillies. They got blown out by Atlanta yesterday, no-hit all the way through to the seventh, and the Mets are now two games behind first. I’m sure David Wright wants to lead the Mets, Mr. Franco. Tell me if anyone wants to lead this division. *Great Stuff is a registered trademark of The Dow Chemical Company. If you’re going to use it, WEAR GLOVES AND EYE GOGGLES AND CLOTHES YOU DON’T CARE ABOUT EVER WEARING IN PUBLIC AGAIN.